I've been waiting for a good opportunity to show you a photograph that I picked up last spring in an antique store. This photo is not my family. I bought it just because I liked it. And I thought I'd give fM some competition in the "200th Edwardian Lady Wearing A White Dress category" ;-) So here it is, my choice for the "Crowning Glory" edition of Smile For the Camera. Aren't these ladies lovely? And aren't those hats fabulous? I fell for this photo in a big way and only wish I could claim a family tie with any one of these women. Unfortunately, I don't have much information about the women or the photograph. So I won't be able to do a full analysis of the photo in the way that fM did of her "Birthday Club" photo. There are 3 names on the back of the photo: Sadie Harrington, Jennie Wilkins, and Essie Sedgeman. 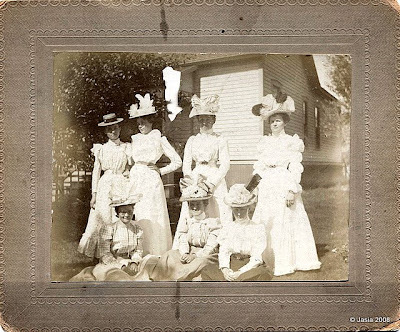 I'm guessing that since the photo was found in a Marine City, MI antique shop that the ladies probably lived in Michigan. Or at least one of them did. There's no date on the photo but the clothing looks Edwardian to me, doesn't it? I did a search for info about the ladies but I just don't have the time to really put in a good effort. I did find the following information in the Michigan Vital Records online. Frank Sedgeman, age 25, of East Tawas, MI married Esther Wilkins, age 25, of Alpena, MI on June 28, 1900 in Alpena, Michigan. The couple shows up in the 1910 census as living in East Tawas. I don't have a lot to go on here but the fact that Esther's surname is Wilkins and another lady in the photo is also a Wilkins makes me think I've got the right person. That and the fact that Sedgeman wasn't all that common a name back then. If this is the correct information for one of these ladies then the photo was probably taken after 1900 when Esther was married and became a Sedgeman. I did a search for Jennie Wilkins and Sadie Harrington too but those names were so common that I was not able to figure out who they were in the time I had to devote to the project. If anyone would like to take a stab at finding more information about them please do. And let me know so I can credit you with that information here on this post.